Take baby steps towards your goal. First, try to analyse and find that one significant thing that can push you towards doing your job. For instance, I don’t like going to the gym and still work out every day. What I do is tell one of my friends to pick me up while going to the gym. When my friend arrives I am bound to go even if I don’t feel like going. When I don’t feel like finishing my assignments, I check out the examination dates and calculate the number of days remaining and check how many subjects to complete. This motivates me to finish off my assignments on time. By implementing these tiny moves, you can easily beat procrastination. Talking to oneself is one of the best ways to find solutions to the toughest worries at times. Apply the same here as well. Sit and do some introspection on why you are delaying or want to quit. You will actually understand that there’s not any significant factor that can convince you that you are on the right path. It is mere laziness or fear of failure that delays you. You need to focus on what is ahead of you at this point and go on. We all have some factors within us that stop us from being on the track. We need to identify these factors that makes it impossible to be disciplined. Sometimes, I think that I will start doing something after I finish my household work or maybe after I take a short nap. Later, I again pick some other irrelevant tasks which keep me ignoring the actual thing I am supposed to finish. Understanding the importance of a deadline can keep you alert and guide you towards your goal. Also, it might be a good idea to outsource some services if you are overwhelmed. If you have a personal statement due and an upcoming exam, find some personal statement services and you will be able to focus on your exam. Being focused is an important factor in achieving your goals. There will always be distractions, but if you remain or regain focus, you are able to achieve your goals effortlessly. Focus is a skill you might have to practice before you become good at it. Meditation can greatly improve your focus, so it might be worth trying. The most important thing that can work you to beat procrastination is building a personal goal statement. It will not only help you remind you frequently about your goal but also help you become motivated by. Envisioning yourself having achieved your goal will better motivate you to do better and work harder. Willpower plays a crucial role in being disciplined. One will either follow their personal goal statement or refrain themselves from doing so. A person with strong willpower has more tendencies towards goals achieving. It is your willpower that helps you get up from bed every morning otherwise you we’ll all just snooze our alarms and sleep a bit more. Be disciplined and beat procrastination, by almost forcing yourself to do the things you don’t want to do, but have to. Deadlines may stress us out, but it is important to review your deadlines often. Developing a timeline or routine with proper breaks and refreshments can actually help you reach your goal in time. Be smart and create an effective timeline for yourself today if you are really keen to stop procrastinating. Procrastination is a big no-no, but we all have experienced a level of procrastination. We like doing things we enjoy and dismiss the tasks that we don’t or the ones that just seems too challenging. You shouldn’t wait until you’re in the mood to do something. Starting, is the biggest hurdle. 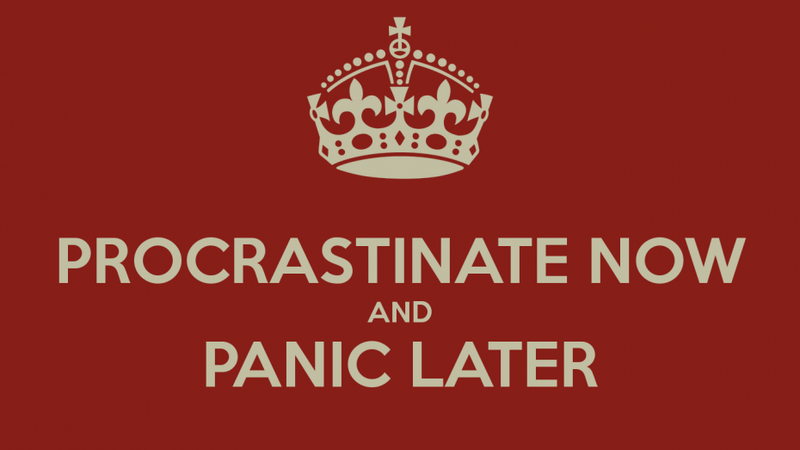 2 Pings/Trackbacks for "7 Must-Read Tips on How To Beat Procrastination"